I have been getting feedback from people who have bought the DVD, on the movie and the whole package, and I thought I would share some of them with you… Remember, if you want your own copy in PAL or NTSC, you can still buy it here... And if you are new to the blog, check out our trailer here, it’s only 60 seconds long and will give you a real taste of the movie. Thanks again for signing and sending me Gone Fishing on DVD - you have no idea how much I was looking forward to seeing this film! Having heard and read so much about how it was made it was driving me insane having not seen it and I was under strict instructions from my girlfriend to NOT play it until she got home from work on it's arrival. Have to say, when it did arrive I was incredibly impressed by the DVD artwork - looks like a proper movie DVD, great first impression and set things up nice for the premier that evening!! That evening I set the living room up for the premier. Curtains closed, lights off, surround sound on full and plasma repositioned to enhance the viewing angle (and let's not forget the popcorn)! I pressed play and sat back. Within seconds of the film starting I was already hooked (sorry, couldn't resist). The cinematography and mood of the opening was incredibly captivating. I was witnessing the standards of movie making that I'm aspiring to. This is going to be a very big mountain for me to climb! The film was amazing and did not disappoint. Everything about it was bleeding with excellence. Emotionally, the film grabs you and gently takes you on a journey that we will all follow one day - coping with the death of a loved one and imagining what might be 'out-there' for them. I'm sure you will never tire of hearing praise for this film. Congratulations Chris, this HAS to win the Oscar. There are far too many 'arty-farty' films out there that do nothing for the film experience and not so many good traditional style movies with the proven formula of a good, relatable story well told. Very much looking forward to seeing your future projects - this stuff is in a different league!! Outstanding! Kyle and I watched Gone Fishing last night. From the moment I put the DVD in, waiting for Kyle to finish brushing his teeth, I sat back and closed my eyes while listening to the music for Gone Fishing. Straight away I was peaceful. Thank you. I felt the tears roll down my cheeks a minute into the movie. We were captivated the moment it started. It is the perfect gift for all those visual people out there. The visuals were incredible and the lighting captured every moment so well. You could not have put a better cast together. The bond between adult and child was beautiful. I don't think there is a soul out there who wouldn't be touched by this movie. If I was a true critic, I would say Gone Fishing is a Masterpiece. After the movie Kyle and I sat there and smiled. We are extremely proud of what you have created. We continue to support and wish you well. Please let me know if there is anything else we can do to support Gone Fishing. In the meantime, we will be ordering a couple copies through the link you have sent previously. IT Trainer and Associate Producer on Gone Fishing, Some Far Flung Land! Gone Fishing is...awesome. Clearly, I wasn’t expecting to be disappointed, given all the raves and the festival wins and the Oscar short-list, but it truly blew me away. It’s a remarkable achievement and I wish I could have been a part of it. But then, when I look back on the time it was coming together and realised how far we’ve both come, I realise that I’ve gone a long way vicariously through you, the film and the blog. Huge congratulations on a fantastic achievement. And if you wanted any further endorsement, my other half hates short films and she absolutely loves Gone Fishing. So, I guess it’s onwards and, indeed, upwards. Thanks so much to everyone who felt they had to write to us to let us know how the film impacted on you. It's such a reward to us all. So here is the email I sent. Last year, film maker Chris Jones led a dedicated group of film makers as they set out to win the Best Short Film Oscar in 2009… It was a lofty goal, but incredibly, with a little help from you, they may just pull it off! The film is a true David and Goliath story called Gone Fishing, only this time it’s not David, but Old Bill, and Goliath is the biggest pike ever caught, set in the nostalgic world of yesteryear summertime, a Kodachrome place we all fondly remember… Already this family friendly flick has won plaudits from critics, celebrities, juries and most importantly, the public… And the response is always the same, WE LOVE IT! Check out the trailer here! 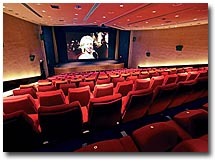 Unable to secure funding from the film industry, the film makers decided to ask every person they knew to get involved and donate a little money – astonishingly, £22,000 was raised to make the dream a reality, and enough to attract stars like Devon Murray from Harry Potter and seasoned Brit actor Bill Paterson. The incredible cast is matched by a world class crew too, with seasoned pro’s happy to lend a hand. The film was premiered earlier this year at the British Academy of Film and Television Arts in London, after which it won the Kodak Awards and the all important Oscars qualifier film festival, Rhode Island in America. 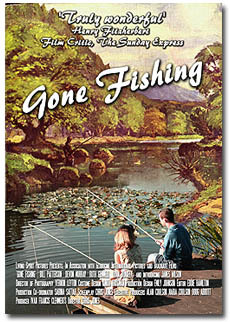 The Oscar nominations are announced on Jan 22nd, and right now, Gone Fishing is in the running. Now is your chance to buy an extraordinary Christmas gift for someone special. Gone Fishing will be a wonderful family film to watch on Christmas day, and with all the extras, it will keep you entertained for hours. The DVD’s are signed too, and if you buy a copy, your money will be used to help with the Oscars campaign push… Just think, if we do win the little gold chap on Feb 22nd, YOU WILL HAVE HELPED US GE THERE! 'Must see' film for the year, 10/10 for a Christmas Present! David Bowen, Hove, East Sussex. ‘Buy it, see it, believe in the dream! ‘It's a unique stocking filler, refreshingly entertaining and more touching than Tiny Tim! 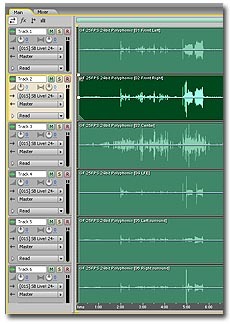 Chat track recording for the DVD release... all done! Over the last couple of days I have been recording the commentary tracks for the Gone Fishing DVD (which you can now buy with the link to the left here). When I started to plan this, the first thing that I realised is that because Gone Fishing is only 13 minutes long, it would be a very short chat track unless we did something! So I slowed the film down to 50%, giving us enough time to actually get into the groove – so on the DVD, there is a second version of the film that plays in slow motion, just for the chat tracks (each running 26 minutes now). 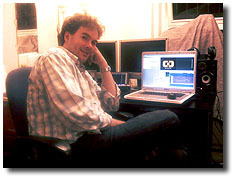 I recorded editor Eddie Hamilton first, in his cutting room at Elstree Studios where he is working on yet another multi million dollar movie. It was a lot of fun to go through the film, revisiting all our choices. On reflection, I was amazed at just how much care and attention we paid in post production – I am always a fan of going the extra distance in post, but we really did and then some! And for my money, it shows. And this evening I recorded DP Vernon Layton in my office. Since the shoot I have become very close friends with Vern and his lovely wife Linda, and I am sure that we will be making another movie again at some point in the not too distant future – we agree on so many things and see our jobs as a real gift. I am grateful that Gone Fishing brought us together in such a serendipitous way. 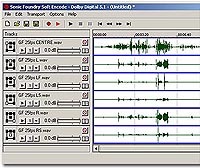 For the techies among us, I recorded the audio on a little Edirol Field Recorder which records to flash memory, and I have to say, the quality is excellent. It’s also so immediate, getting it into an editing system just takes seconds. I have just completed the edit on Vernon and now the DVD is ready to go, so those of you who are wondering where your DVD’s are, they should start being shipped early next week. I also just took delivery of a FedEx from LA so I hope to have the video from the My Hero Film Festival up very soon. 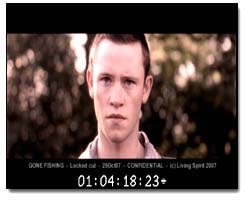 I have spent the day designing the first DVD cover for ‘Gone Fishing’. This is very different to a feature cover in one major way – it will never act as a POINT OF SALE for a buyer. The only people who will get the DVD will either be given it, or come across it some other way, certainly not by pickup it up and thinking ‘This looks good, I must buy or rent it…’ Having received many short films on DVD in my office, I noticed how most attempt to look like a feature film in some way. I am going a different way with ‘Gone Fishing’ in the hope of standing out a little. Now I don’t have to aggressively SELL SELL SELL via the cover, it gives me the chance to start the ‘story experience’ before viewers even gets to the DVD. I am hoping that we will win some festivals and awards, and that, coupled with the great cast, will pique the interest to the point where viewers will put the DVD into their player. I have opted for a nostalgic, fishing book feel. This was directly influenced by a book prop that I had found on eBay, it’s a book from the thirties on angling with a wonderful painted cover. The DVD cover will now set up the viewer expectation of the gentle, lyrical feel of the film, and of course, the angling aspect already implied by the title. I like the artwork very much, though I am aware that it’s not a throat grabber. I think that’s the point. In due course, we will be adding more to it, as I said, hopefully awards from festivals. Of course, the whole thing may be re-invented too. Ah the creative journey to excellence is a rocky one.